Olympic Milk #IStayActive Snap, Share & Win Promo. 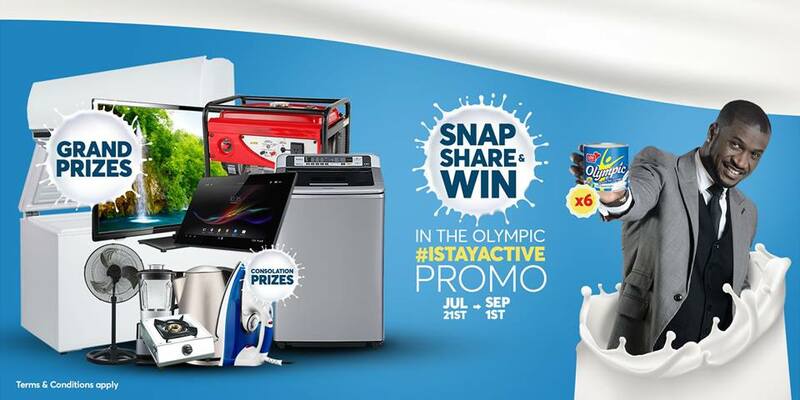 Win washing machines, phones and TVs in the Olympic #IStayActive promo. 1. Purchase 6 tins of Olympic Evaporated Milk. 2. Take a very creative picture with the 6 tins. 3. Follow us on all social media platforms and post your picture under each weekly gift post. 4. Most creative picture wins a prize every week. Promo Runs From July 21st to September 1st, 2018. The Organizer announces competition titled ‘#IStayActive’ Contest, which will be conducted through the Facebook page (Facebook.com/Olympic Nigeria), Twitter (twitter.com/olympicnigeria) and Instagram account (Instagram.com/olympicnigeria) of the Olympic Milk brand. 3. This contest is open to all citizens of Nigeria 18 years of age and above, who are users of the Internet. Participants are eligible only if they have a valid address in Nigeria. All entries will be checked by the contest administrator. Any report or comment of participants which has abusive, defamatory or in any way offensive content and rumors for the Organizer or any natural or legal person and any reference offending the good morals or legality, at the sole and absolute discretion of the Organizer, will be excluded from the Contest. The Organizer has also the ability to exclude any Contest participant performing malicious actions in this Contest. The employees of PZ Nigeria and supporting agencies and their immediate families and spouses are excluded from the Contest. Any participation by these persons in the Contest in violation of this term shall be considered automatically void. The contest will run from 21st July to 1st September (“Contest period”). All entries received outside the Contest period shall be automatically disqualified. Audience will be asked to purchase 6 tins of Olympic evaporated milk and take creative pictures with them. Most creative entries will be rewarded weekly. Multiple answers are not allowed on either of the same or different Facebook name/Instagram account. The submission of these data takes place entirely at the responsibility of the participants and is a statement of participation in the Contest and an acceptance of these terms and conditions. The file the Organizer will keep with the participants' information will constitute conclusive evidence regarding the participation in the Contest and the validity of such participation, in accordance with the term no 8 below. By entering the Contest, the participants declare that they accept explicitly and unconditionally the messaging (via Facebook/Instagram/) or the phone call informing them by the Organizer. The Contest prizes are personalized and the winners do not have the right to exchange them with money or something else or offset them with other offers or another Contest’s prizes in the future. Winners will be announced on Olympic Milk Milk’s Social Media Platforms weekly. - Submitted in accordance with the procedure described in terms above. - Is not a product of illegal technical influences or general fraud or unfair interference of the participant or other person, at the discretion of the Organizer. - Does not offend good morals. Winners will be announced as noted above. The winners, when they see their name, will be contacted by private message via Facebook page/Instagram/Twitter mentioning their full name, a phone number and an email address, in which they can be reached. PZ Nigeria will contact the winners within the next 5 working days. If a winner fails to appear or refuses the prize, it will be transferred to the substitute winner and if the substitute winner fails to appear or refuses the prize too, it will be automatically returned to the Organizer. The winners will receive their prizes by using a government issued identity card. Submission of entries does not guarantee an endorsement as an ambassador by the Olympic Milk brand. 10. Participants are required to act lawfully and within the context of good morals. The participation in this Contest implies the explicit and unconditional consent of the participants for entry of personal data, which will be kept on a file by the Organizer for the purposes of this promotion and for the required time for the purpose. Participants provide the explicit consent and authorization to the Organizer for the promotion and its results exposure, including the identity of the winners, through radio/TV and through the printed and electronic press or the internet, without paying any fees or compensations. Thus the Organizer reserves the right to use and publish the winners' names and images and might use any news item relating to this promotion for advertising purposes and the participation in this Contest automatically provides the consent and assignment of the necessary copyright free. Also, the Organizer may communicate with the participants if necessary during the Contest period or after the end of the Contest. 11. The Contest participants by entering their participation explicitly accept these terms and conditions as essential and are solely responsible for the registration of their real data and their participation in the Contest. The participants may not lay any responsibility on the Contest’s Organizer for the validity of entries, the validity of the selection and anything related to the conducted Contest, as this is a promotion. Also, the Organizer will not be liable of any interruption or problem during the transaction of the Contest due to a malfunctioning of the website/blog. The participation in this Contest requires the contestants’ access on the internet by their own technical resources and costs and does not create any rights against the Organizer or his property, including the intellectual and industrial property. 13. A winner can win only once and there will be one Grand prize winner and 1 consolation prize winner each week. 14. Winner may be required to come pick up their gifts or pay for transportation of gift if they cannot pick it up. 15. After the end of the Contests and the distribution of the prizes, as mentioned above, any obligation of the Organizer towards the Contests participants cease to exist.